Reading – Don’t Blame Mitt! Reading – The Free Internet Will Be Just Fine With Do Not Track. Here’s Why. 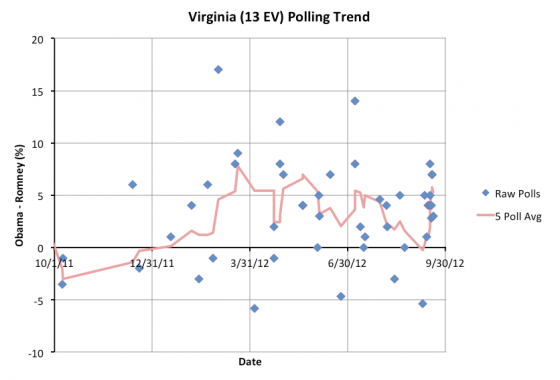 With this, the five poll average in Virginia goes back above 5%. 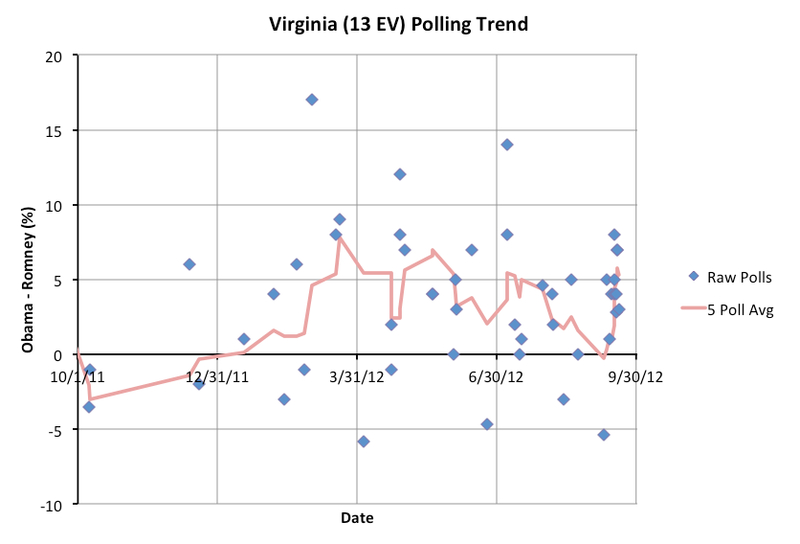 If I’d gotten the polls “in order”, Virginia actually would not have dipped below 5% yesterday at all. Polls arrive out of order all the time of course. As I’ve mentioned before, with a few exceptions when I find really old polls, I mark changes in category based on my best knowledge as of any given day, I don’t try to retroactively change the status on past days. 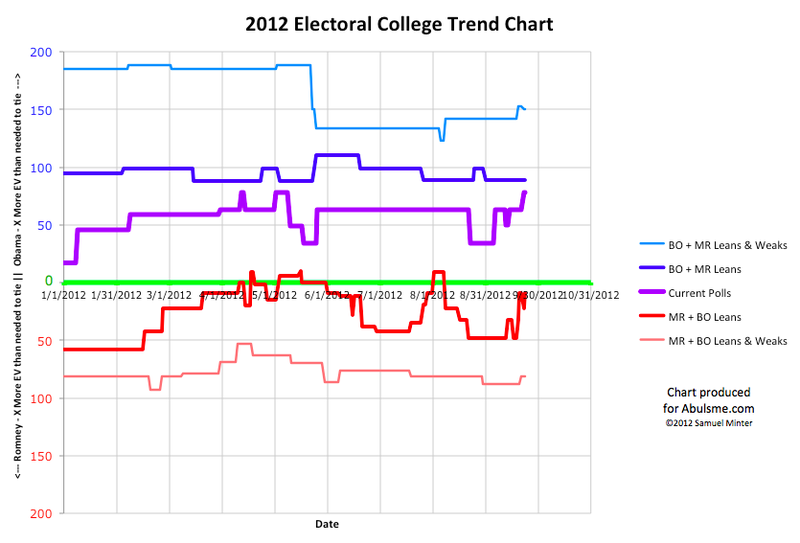 In any case, Obama now leads by 5.3% in the five poll average. So, Virginia once again leaves the group of states I consider possible for Romney to win… if the election was held today that is. Things can of course change. 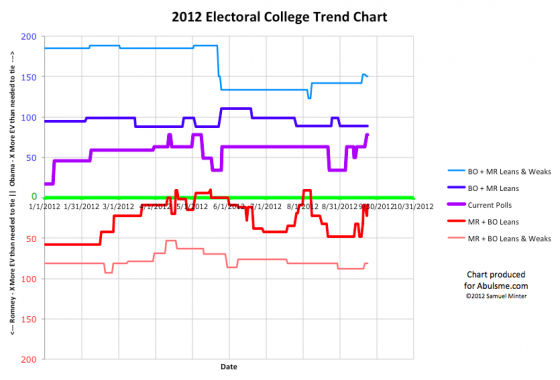 Virginia may be bouncing around the 5% Obama lead line at the moment, but be it a little below or a little above, either way, it is a state that would make Romney’s electoral math much easier if it was actually in play. At the moment, it is just out of reach. Without it, Romney’s road is pretty hard. It has been pointed out that although the state by state math looks bad, if there are campaign events that bring a uniform national move toward Romney, then a bunch of states will of course move in his direction too. That is how it works. 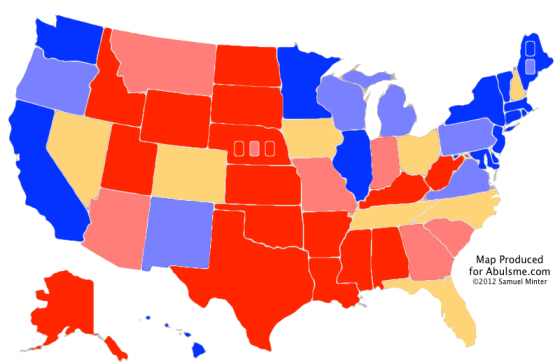 States that are leaning Obama will start leaning Romney. States that are weak Obama and currently out of reach will start being close. This kind of move is very possible. No chickens should be being counted by the Democrats. But time is running out for things to happen (either positive things from Romney, or mistakes by Obama) which bring about that kind of move. Polls looking into how set people are on the candidates they support at the moment show a pretty small percentage of actual undecided or “persuadable” people though. So it may be pretty difficult to bring about that kind of move. As I’ve said before, to get there we probably need a major screwup by Obama as opposed to anything Romney could do to bring people toward him.